Do you like these shades? Beautiful shades of green, love it! I need them <3 ciate looks great! 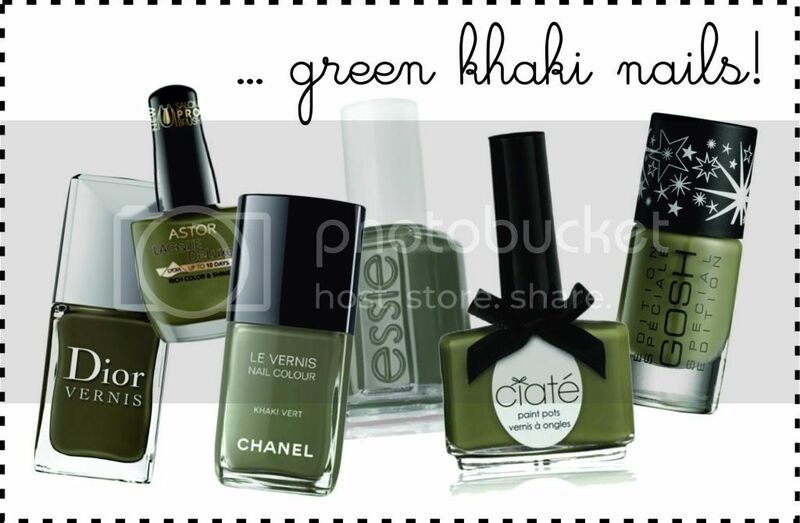 I haven't tried a green nail polish. I have tried orange, blue and black. I will definitely try the Dior or the Chanel. Great polishes, they all look lovely! es hermoso el color! nunca se me hubiese ocurrido pintarme las uñas asi, pero la verdad que es bastante original y lindo! I love those shades! I thought about buying more green colors! My favourite is the one by Ciate! Gorgeous nail color! I love green as well. Great post , that colour nail polish is so unique. These shades are pretty. I don't know if I'd wear them on my nails though. I am pale, & I bet they'd look weird against my skin tone. I really like this shade! I tried to get a green like this.. but I think I failed. My green is much brighter. Tengo un problema graaave con los esmaltes de color verde! los tengo en todos los tonos, me encantan! Saludoos! Oooh I think I'll have to investigate further. I don't really think of it as a chic nail colour but all these finds above are making me question it! Reconozco que prefiero el verde hierba! Pero este tono es precioso!! thanks for follow me, follow you back on bloglovin # 365! hola linda, este en definitiva es el color del comento y me encanta! se ve genial! Yes I do, especially de dark version.